Rome treated us well and now it’s time to explore our second destination Florence, the birthplace of the Italian Renaissance. 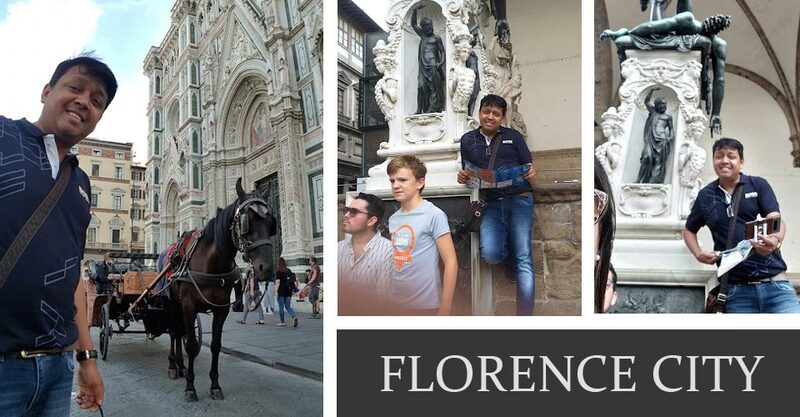 The romantic and enchanting city of Florence treated our eyes with world-class art and architectural masterpieces. Every corner of the city portrayed to us that this small city on the banks of the Arno river in northeastern Tuscany has not changed since the Renaissance. There were many things to explore for us in Florence as it withholds a cluster of heritage sites with its 15th – 16th-century palaces, medieval chapels, marble basilicas, fresco decorated churches, world-class art museums, and the narrow cobbled streets coming alive straight from the chapters of fairy tales. Late in the evening, we left for Florence from Roma Terminal Station of Rome. The train journey till Florence was a very relaxing and comfortable experience. The seats of the trains and other amenities available made our journey an excellent one. It took us around 2 – 3 hrs to reach Florence and when we stepped into the beautiful city it was almost around 9 o’clock in the night. We checked into our hotel, Bokaro, located in a very happening area with multiple restaurants all around. For us staying in this hotel turned out to be more convenient, as there are many Indian restaurants in the vicinity and we didn’t face any challenges getting Indian food. The hotel was decently good with most of the amenities available. Our room was on the first floor and the room was of a pretty good size which was unexpected as generally the hotel rooms in Europe are of small sizes. Next day in the morning after a refreshing night’s sleep and an awesome breakfast provided by the hotel we set out on a bus for our first sightseeing destination, the leaning tower of Pisa. We left our hotel at 8 in the morning and it took us around one and a half hours to reach there. It was raining outside and the rain enhanced the charm of this romantic city more. Hence we were also enjoying the weather outside. 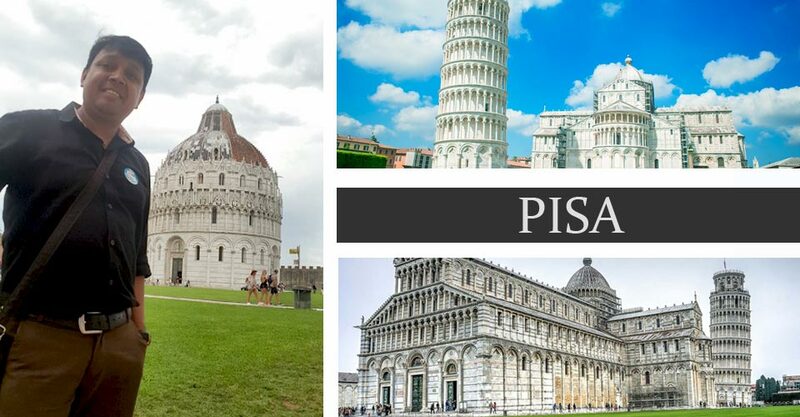 The Pisa tower truly is a symbol of an architectural masterpiece and we were thrilled to see such a wonder of the world in front of us. Leaned at a startling 5.5 degrees off the vertical, the 58m-high tower is one of Italy’s signature sight and truly lives up to its name. Access to the tower is limited to 45 people at a time and children below 8 years are restricted to enter the tower. You need to climb 251 steps to reach the top and occasionally the steps are slippery. All hand items of baggage have to be deposited before entering the tower and cameras are the only things which you can carry along with you. Our guide told us to take care of the belongings as pickpocketing is very common in Italy. Adjacent to the Pisa tower there is one church standing uprightly boasting the beauty and the history of Italy. As we stepped closer to the church it came out to be a huge and profound piece of architecture. The white marble church occupying a huge area was intricately designed with artwork which was showcasing from every corner of it. We were thrilled to see two architectural masterpieces together and took many snapshots to capture our beautiful experience. Next, we halted at a vintage center of Florence which is a cobbled street lined up by shops on both sides which was our next sightseeing spot to explore. It is known as San Gimignano which is one of the old towns of Italy. 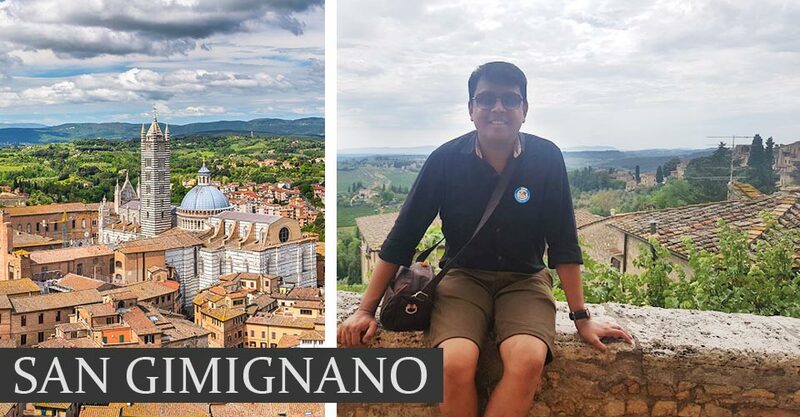 Situated in an enchanting rural setting and enclosed within the 14 towers, the walled town of San Gimignano arouse within us a palpable sense of history amidst the intact medieval landscapes. The shops in this small market town were aligned with Italian souvenirs and apart from those, there are open auditoriums and spas as well. We really felt nice walking along the cobbled lanes of this town passing the shops showcasing Italian artworks. Walking along these streets will let you taste the actual flavor of Italy and you will get to know the culture of them. If you want to take back home some souvenirs for your dear ones, then this place will make you happy while you shop. After the tour of San Gimignano, next, we stopped at Poggio ai Laghi, a vineyard, which was our next destination to explore. The vineyard was an awesome experience and we were taken through the entire story of wines are made. The vineyard tour included lunch as well and we were given different kinds of wines to taste. The robust Tuscany flavored was also a new experience for us and we felt lucky enough to taste so many kinds of wines. Next, we were taken to Siena village, a medieval masterpiece of Florence. Each nook and corners of Siena shouts its excellence in architecture and the souls of its visitors also soar high with excitement. So, we were also not an exception. As we entered the lanes of Siena we could feel the vibrant Tuscany flavor of it which got more vibrant and joyous as the entire place was decked up for a festival. We saw a parade where people dressed in red and yellow Italian attires playing instruments walked past through the streets. We explored the spiritual and secular monuments of Siena and were spellbound to see how they have retained their medieval forms and extraordinary artwork. The streets were populated with artisanal boutiques and sweet-smelling pastry shops. Roaming around in Siena is a feast for the senses and hence is must in everyone’s Tuscan itinerary. After our whole day city tour, we came back to our hotel withholding the beautiful memories and experiences of the city tour of Florence. 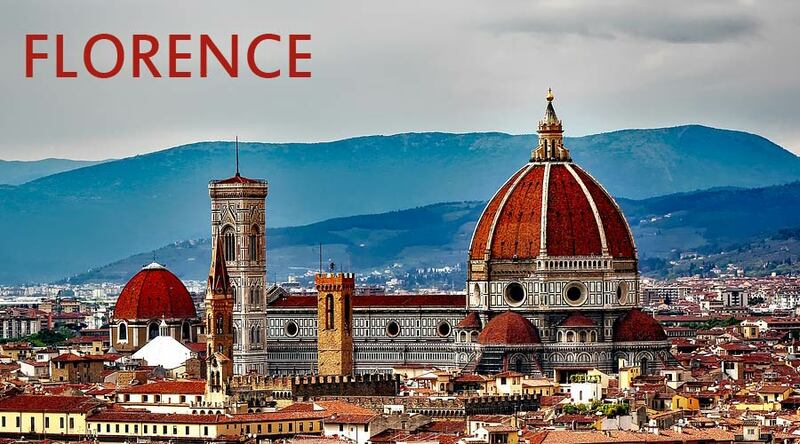 We could feel a sense of excitement and satisfaction within us after this tour and confirms that including Florence in the itinerary was one one of the best decision that we took. Next day keeping the beautiful experiences of the previous day’s city tour locked in our heart we thought to explore the city of Florence by our feet. To me, walking is the best option to know a city closely and to explore every nook and corner of it. Though sometimes it might become a little tiring the lanes of Florence are lined up with many cafes and restaurants nearby where you can relax for some time if your feet hurt. We first went to explore Galleria Degli Uffizi, which is home to the collection of world’s greatest Italian artworks. The vast Palazzo degli, one of Italy’s premier gallery treasuring many best-known paintings of Italy and rooms full of masterpieces. Next, we found out the city’s most iconic landmark, Duomo, adorned by Filippo Brunelleschi, a Renaissance masterpiece with breathtaking pink, white and green marble facade dominating the city’s landscape. We were awestruck to see such a graceful cathedral coming alive from the chapters of history. After walking for such a long stretch our legs were tired and we thought to take rest at a nearby cafe over a cup of coffee. Since we got some time for ourselves so I narrated my experience till now to my wife and I saw that she was also very excited about her experience in Florence. We planned that since we liked Florence, so we will explore the rest of its attractions which are yet left to be discovered. Gorging through the city map once more and gaining some energy from the coffee, again we set off for our exploration. We went to the museums of San Lorenzo and San Marco. The museums are adorned with great treasures of ancient and popular painters and sculptors. We felt fortunate enough to experience such masterpieces with our own eyes. San Lorenzo and San Marco are the places where we found all the historical significances brewing together. Be it the art gallery, museum or the medieval chapels, once you step into these places, you can explore many attractions together. The chapter of Florence ended with great enthusiasm and with our happy faces. Florence was an exciting experience. After our trip, we both were smiling louder whenever we were discussing our experience in Florence. But the time came to explore another city, Venice. With a heart full of hope that Venice will also treat us well like Florence, we bid farewell to this beautiful Tuscan city and started our journey for Venice.